Authorities have released the recording of a woman who called 911 following Friday's shooting of an Australian student in Oklahoma. 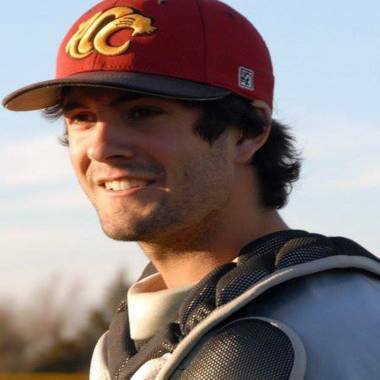 A woman who called 911 after an Oklahoma baseball player was shot dead jogging down the street told the dispatcher that he fell into a ditch, had blood on his back, turned blue and then stopped breathing. In a chilling seven-minute recording released Wednesday by prosecutors, the 911 caller, who identifies herself as Joyce Smith, resists panic while pleading for help. She reports to the dispatcher that she does not know the gunshot victim. “He was standing in the roadway and he fell over, and as I come by, he just fell over in the ditch,” the woman says. The ballplayer, Christopher Lane, was a native of Australia but was a catcher for an Oklahoma college baseball team. He was gunned down Friday in the town of Duncan in an apparently random shooting. From left, James Francis Edwards, 15, Chancey Allen Luna, 16, and Michael Dewayne Jones, 17. Meanwhile on Wednesday, anonymous threats against a local high school where two of the suspects where students led the school to step up security. “The credibility of the person or persons communicating the threats is very difficult to ascertain. However, we want to be proactive in taking reasonable precautions,” Dr. Sherry Labyer, the town’s Superintendent of Schools, wrote in a letter to parents. As result, she said that with help from the police, security would be beefed up in schools across town and that students would only be allowed to leave once a parent checked them out. They would also not be allowed to have lunch off campus, as they normally are. The shooting has dominated news reports in Australia and led former Australian deputy Prime Minister Tim Fischer to call on Australian tourists to boycott the United States. “People thinking of going to the USA for business or tourists trips should think carefully about it given the statistical fact you are 15 times more likely to be shot dead in the USA than in Australia per capita per million people,” Fishcher said. Christopher Lane, an Australian baseball player, was shot and killed while out for a jog in an Oklahoma neighborhood, police say. “This is clearly a tragic death, and we extend our condolences to the family and the loved ones. We understand that local authorities are focused on bringing those responsible to justice. Clearly, we would support that,” said a State Department spokeswoman, Marie Harf. The teens were reportedly turned in by their next potential target, Australian newspaper the Herald Sun reported. James Johnson, 52, told the newspaper that he called the police to tell them that the accused killers were hiding in the parking lot of the Immauel Baptist Church, two hours after they allegedly shot Lane. “My son called me and said, ‘They’re saying they’re coming to kill me.’ So I called the police, and they got here within about three minutes,” Johnson told the paper. Johnson claimed that Edwards Jr. previously had threatened the life of Johnson’s son on Facebook. Friends of Lane set up a gofundme.com project to help cover expenses for his family. 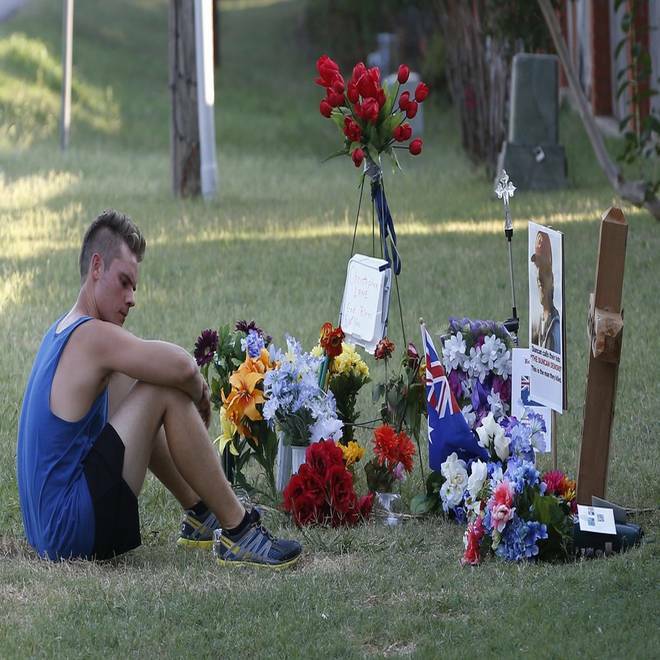 Twenty-three year old Aaron Boyer, who lives nearby, sits by the memorial for slain Australian Christopher Lane. Blamed for murders: A true killing impulse?